I got my baby from 'pets at home' a week ago. They was unsure of the breed of her. She is being seen at the vets for microchip and vaccinations next week so if nobody is sure what breed she is i will check with vet. One of her ears stays down and one stays up. Comments for Does anyone know the breed of my rabbit? 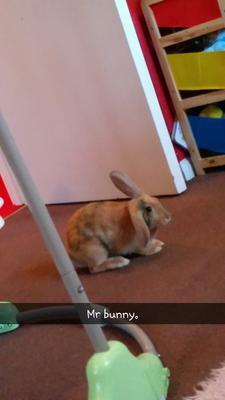 It is a harlequin mini lop I got one from pets at home 2/3 months ago and her ears were both over one shoulder! They are normal lopped now so maybe yours will fall though there are many rabbits with ears like that .I hope this helps. I had one exactly like this and found out it is a harlequin and dwarf lop mix.